The Halloween Season here in Alabama is jam packed with tons of scares. From Haunted Houses and Spook Walks, to Zombie Hunts & Shootouts, Haunted Corn Mazes and Hayrides, there are endless options to choose from during the Haunting Season, no matter where in The Heart of Dixie you reside. With an enormous amount of haunted attractions, it's not always an easy task to choose which ones you and your bravest friends will take on. To make things a bit easier for Alabama haunt goers, Haunts.com has created a list of Must See Haunted Attractions throughout the state. These attractions have received a number of great reviews from customers who experienced the heart pounding fun for themselves, along with outstanding ratings for the 2017 Halloween Season. Check out the list below and start preparing for your 2018 haunting journey! Located in Vincent on Highway 467, Hellbilly Hollow isn't for the faint of heart. 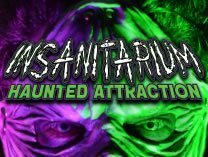 The haunted attraction offers up some serious scares each Halloween Season, giving thrill seekers the perfect way to satisfy their appetite for fright when the spooky time of year arrives. Visitors can take on the haunted house, along with the trail that is full of terrifying twists and turns. Be prepared as you venture through Hellbilly Hollow, as you never know who or what you may come face to face with! One thing is for sure, whatever they are, they've been waiting all year long for visitors... or shall we say victims? While the below haunted attractions may not have been dubbed #1 for the 2017 Halloween Season, the race was tight, and all of our Top Haunts for 2018 are worth visiting this season if you can brave them all! Nightmare at 3008 in Fultondale is a not-for-profit haunted attraction that turns your worst nightmares into a horrifying reality. As you enter, you'll be thrown into darkness, where you'll have no choice but to feel your way around. And as you're on your dark journey, the mad monsters that reside throughout Nightmare at 3008 are bound to make an appearance! Will you be able to handle the heart-pounding fun that awaits? This haunted attraction was established in the early 2000s by the firefighters of Greenville, who work hard each year to give a good scare to locals. And when the thrill seekers do come back to enjoy the fun, the thrills and chills are fresh and frightening for that year! For visitors who are brave enough, a Teaser Ball is offered with admission, and it will signify to the haunt crew that you're fair game for all the horror that awaits! Spooktrail of Quinton offers well over a quarter mile long maze that is infested with the creepiest of creatures! Visitors will travel through an old junkyard in the deep, dark woods of the Mazeum of Monsters & Mayhem, where they'll meet with those who call the trail their home. The trail takes about 30 minutes, and is sure to have you screaming the whole time! Will you be able to survive? Each year, the Montgomery Humane Society scares for a good cause. Visit the annual haunted house and enjoy the terror that's been stirred up all throughout the year. And what better way to get your dose of Halloween fun than to support a great cause at the same time?! Visit AgriPhobia and embark on an intense journey through your deepest and darkest fears. Thrill seekers will be fully immersed into the detailed atmosphere surrounding them and horrifying scenes throughout. Not even the parking lot offers sanctuary from the scares that are within! Be sure to bring only your bravest friends, you never know who will be able to survive and who will chicken out! This haunted attraction is located inside a late 1800s farm house that is known to have some eerie occurrences and unidentified animals surrounding it. Every year for the Halloween Season, the scares get taken to the next level and it goes from haunted to down right terrifying! Don't miss out on your chance to take on the Sleepy Hollow Haunted Farm, offering a number of frightening attractions, including a Haunted Hayride and Haunted Maze! Featuring over 50,000 square feet, Haunted House of Horror in Courtland has more than enough space to make your heart race! Along with the scares, the location offers an 8,000 square foot indoor waiting area filled with exciting and scary activities for haunt goers to enjoy while waiting, or after they've braved the thrills and chills. At the Insanitarium Haunted Attraction, Dr. Ausnemen conducts experiments on the undead and even invented a machine that allows those who visit to see places unknown and encounter creatures unfathomable. Do you and your friends have what it takes to witness such a thing? There's only one way to find out! Visit this Halloween Season and see what new and exciting scares are being offered! At PV Haunted Trail in Rainsville, visitors will be subjected to pure terror as they make their way through the dark and windy paths that are known to be in the "wrong neck of the woods." Witness the vile creatures that live throughout the trail, but beware! They're hungry for the flesh of the innocent! Looking for More Scary Good Fun in Alabama? Check Out Haunts.com's Alabama Haunted House & Attraction Guide Here!